Hidden away in a secluded valley along the Lamoine River in McDonough County, Illinois is a secret place - a place long forgotten by the outside world. It was once considered a magical valley by those who came here seeking peace, serenity and the healing waters of the springs. Today, it is an abandoned village of which no homes, streets or residents remain. Only a once-stately three-story hotel remains here as testimony to days gone by. But while Illinois history has forgotten Vishnu Springs - Vishnu Springs has not forgotten the history that once took place here. It lingers behind as ghostly echoes from the past. The shady valley, surrounded by rocky bluffs that are filled with caves, was long a place that attracted the early pioneers of the region. They used the quiet spot as a place to picnic and in 1884, one annual gathering was said to have drawn as many as 1500 people from the surrounding area. It was not long after this that many residents of the nearby town of Colchester began to realize that the water in the valley was different from the drinking water that could be found elsewhere. All that is remembered today is that the spring water was said to have a peculiar salt content, seven medicinal properties and an especially appealing taste. People began coming from near and far to sample the water, hauling away jugs of it from the springs. Allegedly, doctors sent their patients here on crutches and they walked away without them. By the 1880's, as many as 1500 to 2000 people were gathering here at a time to hold camp meetings and to consume the cold waters of the valley. In an age when effective medicines were rare, the strange tasting water offered hope to a great many people. The owners of the land and the springs claimed that the water would "cure of benefit all kinds of debility, neuralgia, rheumatism, palpitation of the heart, dyspepsia, kidney trouble, worms" and even "female troubles, dislocated limbs, broken backs, deafness, blindness and laziness." And people believed the claims. They began buying the water for 25 cents a gallon and they carried it home with them. The owners of the spring were not immune to the magical charm of the area either. They named the place Vishnu after one of the owners, Darius Hicks, read about the 1861 discovery of Angkor, an abandoned city perfectly preserved for 300 years by vegetation growing out of the Krishna River. Vishnu was a Hindu god, whose earthly incarnation was the river that had covered Angkor. 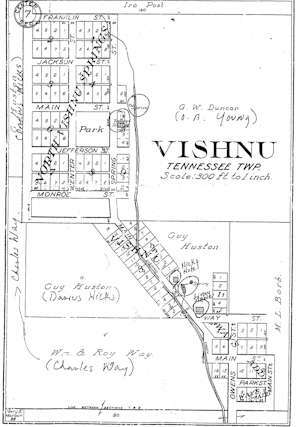 After a Holiness Camp Meeting was held at Vishnu in 1889 and managed to draw nearly 3000 people to the valley, Hicks decided that it would make a perfect place to start a town. The land was surveyed, lots were drawn up and they were immediately sold for $30 each. Darius Hicks was the man who most shaped the village the Vishnu. He was the first to see the opportunity to create a town here but sadly, it would never meet his expectations. 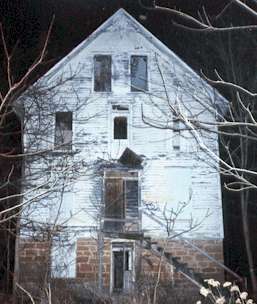 By the 1920's, the once thriving place would be virtually abandoned but the community would survive longer than Hicks himself, whose personal problems would drive him to self-destruction. Hicks was born on May 5, 1850 in Hire Township of McDonough County, Illinois. He was one of three surviving children of pioneers Ebenezer and Mary Hicks. His oldest brother died in the Civil War and a younger sister succumbed to a childhood illness. The Hicks family was a wealthy and successful one, owning 4000 acres of land in McDonough County, along with being breeders of fine cattle. Despite their wealth, the elder Hicks did not allow money to ruin his sons. They attended school until the age of 16, when Darius and his brother, Franklin, were placed in charge of 1000 acres of family land. A Plat Map of Early Vishnu Springs. It was on one of these sections of land that Darius became acquainted with the rich mineral springs that would become Vishnu. He was toiling in the fields one hot summer day and wandered into the shady valley for a drink of water. Almost immediately, he fell under the spell of the place. He later named it Vishnu, being inspired by an article that he had recently read, and later began marketing and selling the water. In 1889, he became quite aware of what the springs had to offer, but he also became aware that he would reap the benefits of them at a price. As nearly 3000 people came to attend the Camp Holiness meeting at Vishnu, the devoted trampled down an entire field of Hicks' corn and frightened a prize bull so badly that he disappeared. A herd of cows, startled by the influx of people in their meadow, wandered into a field of young wheat and decimated it. Hicks now had to choose whether to farm the land or develop it - and instead of farming, he chose to build a town. Since Vishnu was planned to be a health resort, Hicks had to build a hotel. He went into partnership with John and Milton Mourning and by May 1889, a large building was starting construction near the spring and it was named the Capitol Hotel. It towered to a height of three stories and it was completed in September of that year at a cost of $2,500. During that first summer, Hicks continued to publicize the springs and once the land in the valley went up for sale, it was quickly purchased. The lots were snatched up and by October, Vishnu Springs had its first real occupant. His name was Andrew Ruddle and he constructed a small house near the hotel. That winter, David Reece opened the town's first store. By the following spring, Vishnu had two more stores, a restaurant, a livery stable and blacksmith and a photo gallery. Hicks organized the "Vishnu Transfer Line" that made trips from Colchester to the new resort. For the cost of 75 cents, a passenger could be transported to Vishnu, have dinner and then be transported back. For an additional fee, a passenger could bypass the normally used spring wagon and be taken to the resort in a carriage or a canopied buckboard instead. Although local newspapers reported that Vishnu was an idyllic "boomtown", there was an undercurrent of trouble at the springs. Hicks evidently did not get along well with his developer, Charles K. Way, and there was talk of dividing the community into two parts. Way eventually developed land southeast of the hotel. Also, the resort became known for the sale and consumption of illegal alcohol (Colchester and the county were both "dry" at that time). The drinking on the grounds of the resort led to occasional fighting. In the fall of 1890, Andrew Ruddle stabbed restaurant owner John Mourning and while the wound was not fatal, Ruddle was arrested anyway. Meanwhile, despite the drinking and the fighting, Hicks continued to develop the resort as a place of peace and healing. A new organ was installed in the hotel parlor and the building boasted a number of other improvements, like running water and an elevator to reach the third floor ball room. Amusements were added for the resort travelers, like a real horse-powered carousel and the lawn around the hotel was fitted with swings, hammocks, a croquet grounds, a picnic area and a large pond that was dubbed "Lake Vishnu" and stocked with goldfish. A small stream flowed away from the lake and vanished into the mouth of a large, unexplored cave. Hicks also built a racetrack and established a park, both of which were not in the valley but on a nearby hill. A set of 108 wooden steps had been constructed to reach the part of the town located on the hill. He also promoted and arranged for cultural activities like dances, band concerts and holiday celebrations. He also organized a literary society and opened a schoolhouse for the children who had settled in Vishnu with their parents. Although it sounds as though the town was rapidly growing, in truth, it wasn't. Most of Hicks' efforts were being spent on a small number of full-time residents and the travelers who came to take in the waters. There were never more than about 30 homes in the valley and the hotel was not active in cold weather months. For this reason, the village never really gained an economic base, even as a popular resort, for there was no railroad connection to it and it was far from any sizable town of the era. The residents managed to persevere through and gained a post office in 1896. Hicks eventually moved from his nearby farm to the town itself and served as the local postmaster for several years. While Hicks struggled to create a viable community at the springs, his personal life was filled with even greater problems. In 1889, Hicks had married for a second time to Hattie Rush of Missouri, one of the many pilgrims who had traveled to Vishnu in search of healing waters She had also been married before and had children of her own, including a 12 year-old daughter named Maud. Hattie suffered from a variety of illnesses like Bright's disease and was plagued with heart trouble and dropsy. She died in 1896 at the age of only 40. Whether or not his marriage to Hattie Rush had been happy or not, Hicks then went on to do something that was scandalize those in the region for some years to come - namely, he married his step-daughter. Maud became the third Mrs. Hicks in September 1897 in a private, civil ceremony at the McDonough County courthouse. She was only 20 years-old at the time. Although the marriage was not actually incestuous, it was seen as improper and Hicks was shunned by the more conservative members of the community. This did not keep him from continuing to seek happiness though and in 1898, Maud gave birth to a son and in 1903, gave her husband a daughter. In just two years though, Maud would be dead and a curse would settle over the struggling, yet peaceful community of Vishnu Springs. In 1903, two events would take place that would lead to the decline of Vishnu. On one warm summer day, the carousel was filled with children, carefully watched over by the owner, who supervised their play and made sure that the horse that turned the gears continued to walk. It is unclear what happened, but somehow, the supervisor's shirt sleeve became tangled in the gears of the carousel and he was pulled into them. The children's cries of delight and laughter turned to screams of terror as the man was crushed to death. The carousel ground to a halt and it never ran again. After leaving Vishnu, Hicks bought a farm a short distance north near Blandinsville and took up residence there. He soon hired a housekeeper named Nellie Darrah, a widow, who was needed to help care for Hicks' two young children. In the years that followed, Nellie became a mother figure to the children and became romantically involved with Hicks. By the winter of 1908, Nellie had become pregnant and confronted Hicks, demanding that he finally marry her. He refused and she subsequently gained an abortion. Not surprisingly, thanks to the time period, the procedure did not go well and she had to be hospitalized. While in the hospital, Nellie contacted Hicks and threatened to publicize their entire affair. Hicks met the threats with silence and quietly removed his .32 caliber rifle from his closet. After writing a letter that explained his entire situation, he shot himself in the head. Hicks died from the wound at the age of only 58. The death of Darius Hicks sounded a death knell for the community of Vishnu Springs. He had been the main builder and promoter of the town and had literally given the place a spirit. 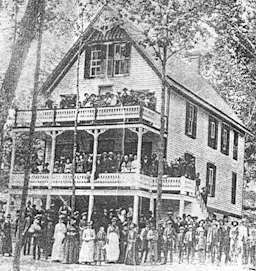 He had remained involved in the business of the town and his hotel, even after moving to Blandinsville. There was no one who was as invested, both financially and personally, in the village. Hicks' death sent the community into a decline that it never came out of. The hotel and the town, now under indifferent management, began to attract gamblers, thieves and criminals. On one occasion, a huge quantity of counterfeit half-dollars, which looked like the real thing but were made from pewter, were seized here. The maker of them had been passing them off in illegal poker games at the hotel and someone had eventually alerted the authorities. There were other stories of law breakers captured at Vishnu as well and legends that much of their loot was hidden away in the caves around the settlement. If there is any element of truth to such stories, the money still remains lost today. Dr. Isaac Luce, who had settled in the village during its time of greatest prosperity, tried to develop the land that he owned on the north side of the village but with no success. a man named Campbell also tried to stem the flow of people moving out of the now declining homes and businesses but his enterprise was also doomed to fail. Eventually, the property was sold and left to decay. By the 1920's, Vishnu was nothing more than a legend-haunted ghost town, abandoned and nearly forgotten in the secluded valley. Vandals stole valuable hotel furnishings and broke out the windows of the buildings and the old hotel. Other visitors found their way to the spot and the inside of the hotel filled with their signatures. The earliest names scrawled on the walls are those of Marie Feris and Lil Baker, who came to the Capitol in 1893, when it was still in business. The owners encouraged the now historic graffiti but the marks and scrawls that still appear today have lost the charm and the innocence of the signatures of the past. By the 1930's, the hotel had decayed into little more than a shell and the owner, a local banker, lost all of his property during the Depression. It seemed that the "curse" that plagued Vishnu was continuing to wreak havoc. In 1935, a restoration effort was started by Ira Post. He bought the hotel and 220 acres around it. He restored the building and hired Lon Cale as the caretaker. They opened the former resort up as a picnic grounds and while it met with a limited amount of success, Vishnu would never be a community again. He and his family lived at the hotel for weeks at a time, overseeing the work that was being done. As with Darius Hicks, the magic of the little valley had worked its charm on Ira Post and he longed to open the place back up to the public again. Post died in 1951 and while the hotel was occasionally rented in the years after, the grounds became overgrown and unkempt. His children had all moved away and soon even the caretaker was no longer needed to watch over an area that had once again faded into memory. Soon, it was completely abandoned once more. In April 1968, Alfred White and Albert Simmons talked Ira Post's niece into letting them try to revitalize the place once again. Their plan was to open the hotel and offer food and country music to the public. The venture soon folded and Vishnu was abandoned once again. In the early 1970's, Vishnu Springs saw life again as a sort of commune for a group of Western Illinois University graduates and their friends. They turned the hotel into their home and sacrificed their professional careers to live with nature. Earning enough money to pay the rent and the expensive winter heating bills, the group gardened and raised livestock to make ends meet, occasionally hosting music festivals that featured groups with names such as "Morning, Morning" and "Catfish & Crystal". Eventually, they too were gone and Vishnu was once again deserted. As the years have passed, the old hotel has continued to deteriorate and today it is little more than a crumbling shadow of its former self. Despite the interest of local societies and historic groups, the valley remained private property until the death of the last member of the Post family. Since that time, the status of the land has remained in limbo and the ultimate fate of Vishnu remains a mystery. And perhaps it is this very mystery, as well as its isolation, that has been the source of the legends that have come to be told here. As the town fell into ruin and the houses collapsed and were covered with weeds and brush, those who ventured into Vishnu came away with strange and perplexing tales. The accounts spoke of a woman in black who roamed through the abandoned streets. Who this woman may have been is unknown, but she was said to vanish without a trace when approached. Visitors also told of sounds from Vishnu's past, echoing into the present. They were the sounds of voices, laughter and music, as if glory days of Vishnu were still being lived out - in a world just beyond our own. And apparently, the sounds of everyday life continue here as well. One visitor, David Grindstaff, told me personally of visiting the hotel and hearing the sound of someone pounding on metal coming from outside. It would not be until I showed him an old map of Vishnu that he realized the sounds were coming from the direction of the old livery barn and blacksmith shop. No trace of this building remains today and no hammers and anvils can be found among the ruins of Vishnu. Is Vishnu Springs a haunted place? Perhaps not in the traditional sense, as aside from the legendary woman in black, there are no ghostly apparitions to be found wandering in the darkness. Nevertheless, how do we explain the eerie sounds that have been reported by several generations of visitors to this quiet place? Can they be anything but echoes of a time gone by? 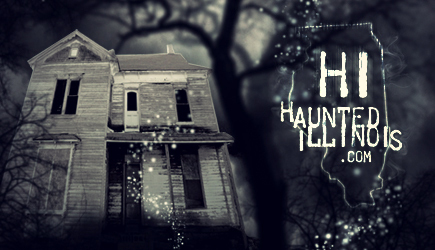 So yes, Vishnu is haunted by the ghosts of the past and it remains a part of Illinois history that most have forgotten. Sadly, vandals have caused more than their share of damage here and unfortunately, Vishnu and the Capitol Hotel have been abandoned to their mercy. The state of Illinois has already declared that the hotel is not old enough or important enough to be considered significant and for this reason, is beyond their protection. Thankfully though, the isolated location of the valley manages to keep the worst of the curiosity-seekers away. To reach the site of Vishnu requires more than two miles of walking through dense forest and such a sense of direction to find the wooded road that most don't bother to seek it. If you should be lucky enough to find the place however, you will step into the shaded valley and feel as though you have stepped into another time. Little remains here except for the old hotel - the carousel, the restaurants and the 108 steps are long gone now - but if you look closely, you are bound to stumble across other pieces of the past. Remnants of gardens and patches of flowers remain among the undergrowth, along with forgotten souvenirs of the town that was once nestled under the trees. The stream still trickles into Darius Hicks' lake and a stroll along the water may still reveal a goldfish or two, descendants of those left here more than a century ago. But be careful how you step in Vishnu and leave nothing of what you bring with you behind. It is up to those who consider themselves caretakers of the past to preserve what the state of Illinois will not. Years ago, Ira Post's niece and daughter erected a sign at the entrance to Vishnu and while the sign is gone now, the sentiment behind it remains. It would be good of us to remember this - for with our history gone, out ghosts will also be lost. The sign read in part: "Vishnu Springs was preserved as planned by Ira Post. The spring water of the wonderful world of nature is left to enjoy.. the springs should be left as nature provided it. Take care of it all and then all will be benefited in the years to come. Ira Post died in 1951. The wishes expressed here were his. Help us to see that his wishes are carried out." Note: Vishnu Springs is Private Property and due to the amount of vandalism that has occurred in recent years, the area is now closed to visitors. There is hope that the area will be opened again in the future but at this time, trespassers will be prosecuted. Check back to the website for updates and future information.